Lewis Hamilton has won the 2015 Grand Prix after starting from pole position. 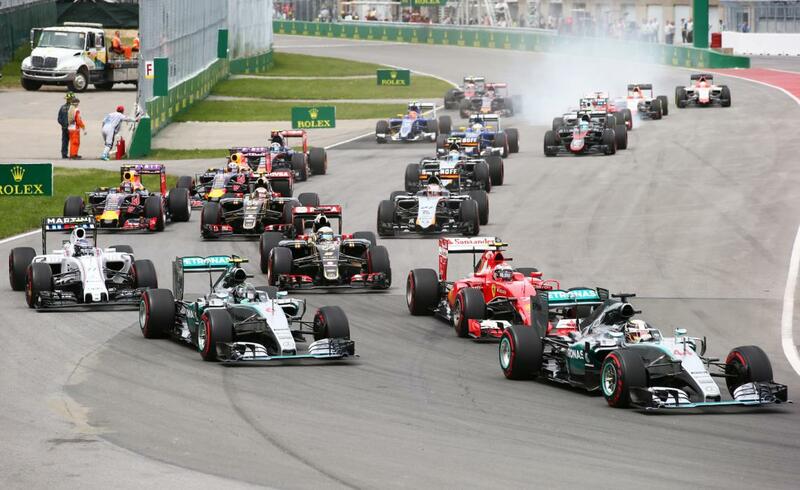 The British driver led all but 1 lap, only losing the lead during the pit-stops, to take the win ahead of team-mate Nico Rosberg and Williams driver Valtteri Bottas. Nico kept Lewis honest for much of the race, with the gap between them ranging at just under 2 seconds for a majority of the race. Ferrari had a mixed race as Raikkonen lost a podium due to a spin whilst team-mate Vettel put in a combative drive from 18th to take 5th. Hamilton made his intentions clear as he pulled up to the front of the grid. He aimed his #44 car directly across the line Rosberg would be taking into turn 1. Indeed when the lights went out Hamilton was quick to cover off his team-mate as he held the lead, with Kimi Raikkonen unable to split the pair in his Ferrari. Raikkonen’s team-mate Vettel was unable to make as many positions as he hoped he might from 18th on the grid; with the German only 16th at the end of lap 1. Soon he got ahead of Nasr and then Carlos Sainz with a late breaking move into the hairpin. Felipe Massa was also working his way up through the field after starting 15th, with the Brazilian pulling off a cheeky maneuver through turns 1 and 2 on former team-mate Fernando Alonso. Vettel soon reached the back of Alonso’s McLaren, with the Ferrari just having a tad more speed than the Honda. Massa and Vettel were almost working together to make their way through the field in the early laps. The pair were up to 12th and 13th at the end up lap 7, but suddenly Sebastian peeled into the pits for a very early stop. The stop was a tactical decision as he was losing too much time in traffic, but a slow left-rear change cost him 5 seconds. Sebastian soon set about trying to carve his way back toward the top 10, but he met an obstacle in the form of Fernando Alonso. Vettel used DRS to draw to the outside of his 2012 title rival, but Alonso just kept a hold of the position on the inside to force the German across the kerbs. Alonso held the position at the same corner a lap later, but Vettel was able to sneak ahead on the second DRS zone into turn 1. In the meantime, Vettel’s former wing-man Massa was busy fighting with Ericsson for 11th place. The pair went side-by-side into turns 1 and 2, with Massa almost sliding into the side of the Sauber. The pair made slight contact on the short chute to turn 3, with Massa managing to prevail on the inside. He was soon into the top 10 as he used his Mercedes engine and DRS to breeze by Daniel Ricciardo and Sergio Perez on the back-straight. Kimi Raikkonen was the first of the front-runners to dive into the pits at the start of lap 27 of 70. A decent stop got him out in 4th behind the Williams of Bottas, but soon he lost a whole chuck of time as he spun round at the hairpin. The amount of time he lost was enough for Bottas to pit and re-join ahead of his fellow countryman in 3rd place. Race-leader Lewis Hamilton had led the race right from lights-out; in the process taking over the mantle of leading more laps in Formula One than any other British driver in history. He finally relinquished the lead at the end of lap 29 as he peeled into the pits, but promptly re-took the lead on the next lap; with Rosberg coming out of the pits just 2.3 seconds behind. Rosberg had cut the gap by 1.3 seconds during the pit-stop phase and was getting closer tenth by tenth, lap by lap. Mercedes boss Toto Wolff seemed to be in anxious conversation with Niki Lauda in the garage, with the team ordering Hamilton to save fuel and Rosberg to save brakes. It was a year ago in this Grand Prix when the Silver Arrow’s brake issues cost them a 1-2 to Daniel Ricciardo. A similar brake issue had affected them both in this year’s Bahrain Grand Prix. These memories probably provided the Mercedes team with some anxiety as the laps ticked down. 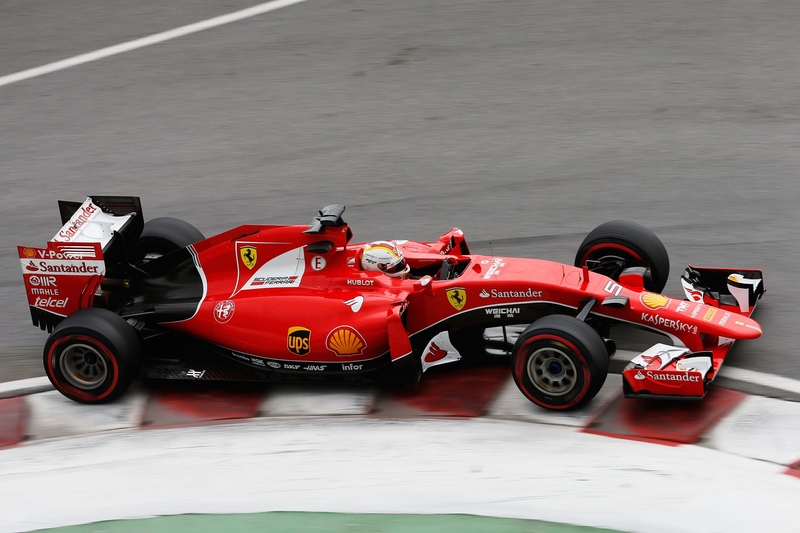 Sebastian Vettel was still moving up and was now in the lower reaches of the top 10. It seemed like his preferred hunting ground was the entry into the turn 13 chicane. This became evident when he tried to get around the outside of Hulkenberg. The move looked tight, with Hulkenberg spinning the Force India to the outside of the circuit. Vettel clambered over the kerbs but took 7th place, but no contact was made between them which allowed the Ferrari to keep the place un-penalized. One move that was penalized was one made by Romain Grosjean. The Frenchman had been running in a solid 5th place, his and Lotuses best performance of the year, when he tried to lap the Manor of Will Stevens. Grosjean passed him as they made their way toward the final chicane, but Grosjean appeared to move over far too early and give himself a puncture after contact with Stevens’ wing. The pair immediately pitted, with Grosjean exclaiming that “He [Stevens] hit me. He hit me!” Stevens on the other hand lay the blame firmly in the Frenchman’s court asking, “Where does he want me to go? Off the track?” The stewards agreed as they handed Romain a 5 second time penalty that would be added to his race finish. The contact put Grosjean’s team-mate Maldonado briefly into 5th before the Venezuelan was demoted by a hard-charging Sebastian Vettel. At the front of the pack, the gap between Hamilton and Rosberg had never really widened above a few seconds, but Hamilton seemed to have the pace to keep his team-mate at bay should he need to. His team requested marginal lift and coasting in order to save small drips of fuel should he need. He then began to open up more of a gap to his team-mate before being told with 2 laps to go that he needed to save a little more fuel. 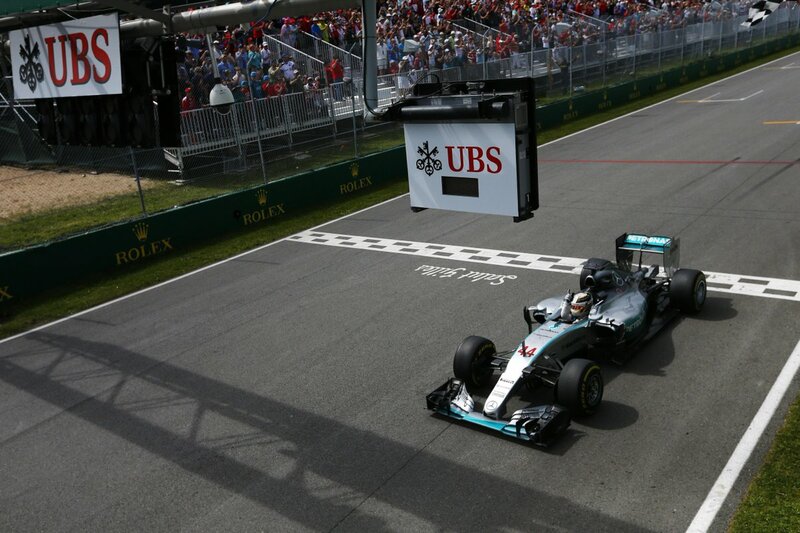 There were no last minute dramas for the #44 driver as he crossed the line soon after to take his 4th win in Canada. Valtteri Bottas took Williams’ first podium finish of the year after capitalizing from Raikkonen’s spin. The Ferrari driver would hold on to take 4th, with his team-mate Vettel putting in a great drive to get 5th after starting 18th. Felipe Massa would also battle through the field to get 6th after starting 15th. Pastor Maldonado brought home championship points for the first time since last year’s United states Grand Prix. He finished ahead of Nico Hulkenberg, Daniil Kvyat and the second Lotus of Romain Grosjean; who could’ve taken much more than a singular point away from the Circuit Gilles Villeneuve. Only three drivers retired from the race. Roberto Merhi’s Manor succumbed to mechanical issues for the first time this season. Neither McLaren would finish the race, with Fernando Alonso finally letting his frustrations get the better of him. During the race he remarked that their problems made them look like ‘amateurs’. The result give Hamilton a little more of a buffer over his team-mate in the drivers’ championship standings. He now lies 17 points ahead of Rosberg as the pair continue to rack up the points for Mercedes in the constructors’ standings. The next race see’s the teams return to the Red Bull Ring for the Austrian Grand Prix, the sight of a win for Rosberg over Hamilton last year; a result Rosberg would be hoping to repeat having looked a little closer on pace today.